You are currently browsing the tag archive for the ‘development’ tag. It’s already 8 months since my little guy became part of our world – and how do I love him! Every day he reminds me of how incredibly cute a baby can be. He’s also fond of swooshing those podgy arms up and down, up and down, with straight elbows, almost as if he forgets that his arms can bend in the middle. He sometimes gets so excited when he sees me that he looks like a tiny Mexican wave. I love slipping my finger along the creases of his wrists and ankles where invisible elastic bands rumple rolls of baby fat. He gave his first roars of laughter when he was just 2 months old. It happened when I undressed him. It turns out the little dude is incredibly ticklish! He’s also very fond of making lots of noise – laughter, crying, complaining, chatting, or even piercing experimental yells in the supermarket – anything goes! He’s definitely much more vocal than his sister used to be. At his 6 month follow-up, he was 8 kg and of cuddly squishiness with both his length and height on the 50th percentile – which is a bit surprising as we’re a family of tall, thin giraffes. Where does this little ‘shorty’ 😉 come from, I ask you? Shortly after he learned to sit unassisted (at 6 months), he started launching himself forwards – rather boldly – in order to expand his reach. As second child, in addition to the need to reach toys, he has the motivational factor of a sibling from which he needs to be able to retrieve a toy after he started playing with it. He is now scooting around, creeping forwards and crawling a little – mostly backwards still. He’s pushing himself up on his hands and feet – like a bear. He’s pulling himself up against anything suitable or unsuitable for such an exercise. It’s becoming quite tricky to bath him, as he just wants to stand in the bath, holding on to the bath’s rail-handle-thingy-whatcha-call-it. I sometime worry that my boy might be sleeping too much – imagine that? When I chat to Dr Google I’m always assured that he sleeps as much as an average baby does (or maybe only a teeny bit less). What a relief and what a welcome change after his little stay-awake-all-the-time sister! DH, little sister, baby boy and I all sleep in the same room. I wasn’t sure whether this arrangement would work, but we’re sleeping a lot better than when my little girl was a baby! DH, baby boy and myself all bed-share, and I love it (little girl sleeps in her cot still). It feels so right and so awesome to do this. He still sometimes have a drink or two in the night, but the two of us barely even wake up for that – and DH and my little girl doesn’t seem to be woken by that at all. Breastfeeding him is a piece of cake. I’ve started giving him water in a bottle, but he’s still working on figuring out how to make that work. He usually ends up with very wet clothes – which is maybe his intention in any case, yes? Feeding solids is going OK, although he tends to gulp lots of air and often ends up all windy and crampy. He regularly tries to supplement his diet by eating paper – letters, junk mail, grocery lists, till slips, you name it. He can make half an A4 page disappear in seconds, the moment I turn my back! And just you dare try and fish the remains out of his mouth through those razor-sharp little teeth. I love watching how the relationship between his sister and him unfolds – but more about that in another post sometime. I so often wish I could have a photo of every second we have together with this comical little baby dude. DH and I were having a lazy Sunday morning with breakfast in bed and our ‘babaliefie’ was sitting between us, playing with her toys and creating some of the usual random havoc and giggles. At some stage she was playing with my hand and putting my fingers in her mouth. I suddenly felt it! There was one very sharp little tooth in there. During the day, another little tooth joined the first one. I’m savouring the last of those big (seemingly) toothless grins as my ‘liefietjie’ reaches another milestone. Last Sunday we were shopping and my baby angel had been sitting in her pram for some time. Then she suddenly looked at me and raised her arms. It was the sweetest thing! She was clearly asking to be picked up, so I obviously swept her up in my arms with kisses and cuddles. She now raises her arms everytime she wants to be picked up and also when I say, “Kom, liefie!” (Come, sweetie!). Simple as this gesture may be, it has taken the communication between us to a lovely new level. Day-care is going sooo much better! My baby angel still sometimes cry when I leave her in the morning, but it seems she’s fine the rest of the day. When I pick her up in the afternoon, she’s always happy and content – and very pleased to see me. I’m so relieved that she’s settled now at day-care, but I’m also wondering whether she misses as much as I miss her every work day? Now if only I could get my baby to sleep at night! The past week or so has been hectic and the past two nights have been the worst! Lately we’ve had to pop her dummy in what feels like a gazillion times per night. The past two nights she also wanted 2 feeds and last night I even got up and gave her a bottle of formula after the second feed. Growth spurt, maybe? Whatever it is, I just hope I get to sleep again someday. I feel like a zombie in a car wreck every morning when the alarm goes off. She’s eating well and loves her food. By now she’s even had home cooked dinners a few times (pureed mince and lentils with veggies and pureed spaghetti bolognaise – no sugar or salt added). In terms of her development, my baby is doing things her way. 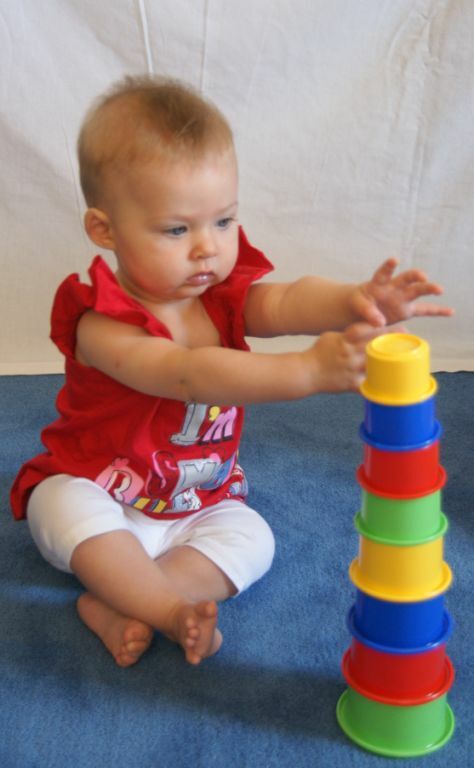 She’s always had very strong extensor muscles and has loved doing full weight bearing in a standing position even when she was only a month or two old. This helped her achieve unassisted sitting so relatively early (for a late pretermer) and at a time she was not even rolling over yet. By now (6 months 3 weeks unadjusted for prematurity) she’s rolling over like a champ and if she’s on her tummy, she’ll try to reach a toy that’s just beyond her grasp by rolling over towards it. Up to now I could leave her on our bed when I was getting ready in the morning, but now I have to put her in the cot for those moments when I’ve got my back turned. I’m slightly concerned that she’s not getting enough experience of weight bearing on her elbows and hands, as she completely skipped assisted tripod sitting (i.e. sitting propped up on her hands) and does not love being on her tummy. Yes, as a former paediatric Occupational Therapist, I’m sure I’ll always find something to be (at least) slightly concerned about! She now displays fear of strangers, particularly directed towards ‘ou omies’ (older men). Admittedly, ‘ou omies’ sometimes scare me too! And lately, if I hand her over to a friend, she’ll look up at the lady’s face, start looking uncertain and finally begin to cry till I take her in my arms again. She’s generally a quiet, cheerful little baby. She doesn’t ‘talk’ that much, but she’s always smiling. She loves it when I sing her songs and when we play games. She’ll look into my eyes and touch my face with her tiny hands – and pull my hair, which is a bit less endearing. She loves bathing and showering. She loves it when we go shopping and she’ll smile at everyone looking in her direction (as long as she’s in my arms or in her Kanga carrier). Lastly, as far as cuteness is concerned, my word! I didn’t even know babies come in this cute. How I love her, this perfect little baby angel of mine. She’ll be 6 months old tomorrow.